tl;dr: Table drafting for fun and profit, much better with expansions. Getting to the Game: Setup is smooth - it's just a matter of shuffling a bunch of decks of cards, then dealing out a number of them face up determined by how many players are at your table. The modular score tracker serves the gameplay very well overall and was well thought out. **NOTE: Setup and various gameplay changes based on the expansions are outlined further below. 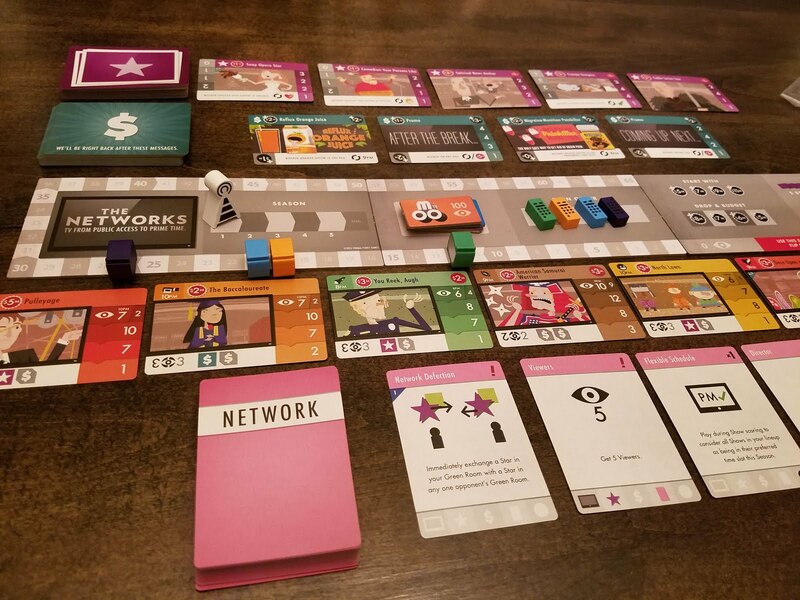 Learning The Networks is surprisingly easy, and alongside the fantastic playful art of the game, sells short a decently complex scoring mechanic. While you'll live or die in a given season (round) of The Networks by the amount of money in your coffers, your lifeblood is the viewers. At the end of the game, they're the only thing that matters, and while earning them may be easy, keeping them is much harder. Whichever network has managed to secure the most eyeballs on their programming at the end of five seasons wins immortal glory. Playing the Game: I'm going to give a brief intro for new players of how the base game works overall, so if you're here strictly for the expansion content, skip on down. 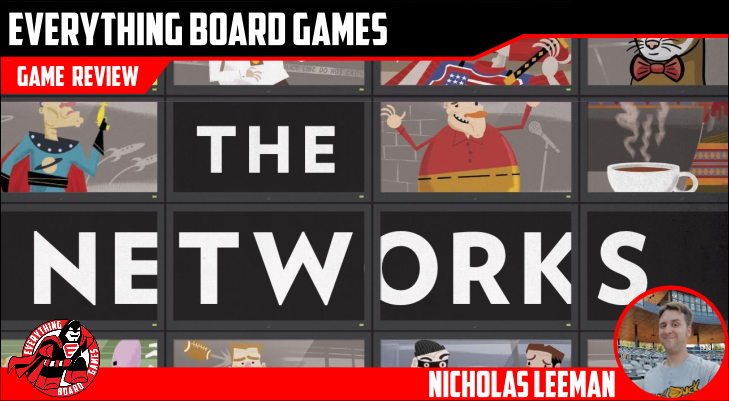 If you don't know how to play The Networks at all, some of this explanation might be a bit bare bones. 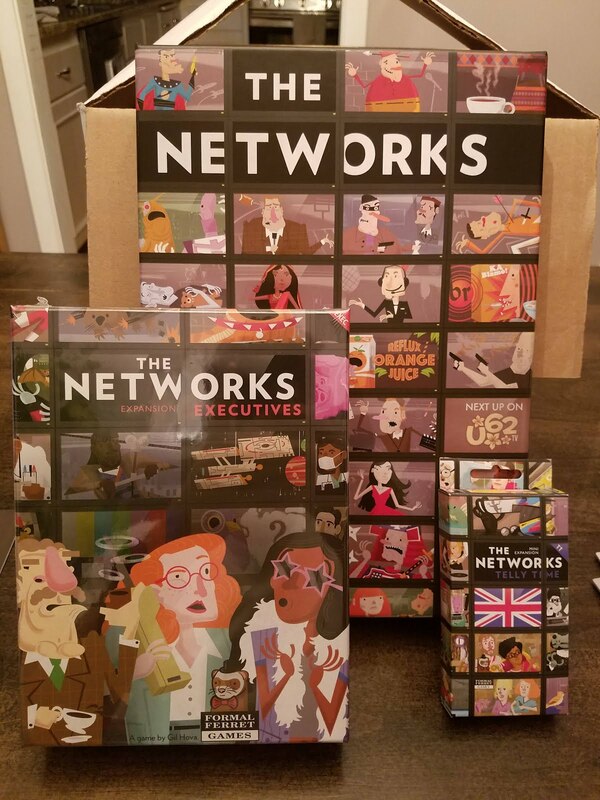 In varying turn order each season, you and your fellow executives will go around the table nabbing brand-new shows for your three-hour prime-time lineup, ads to keep your cash flow in the black, stars to pump up your viewers of those shows, and bonuses bestowed upon you by the shadowy powers-that-be in your network. Be the first to decide you've done enough for the season, and you can "drop and budget," gaining declining bonuses for passing up the opportunity to grab more prime-time assets. At the end of the fifth season, so as not to invalidate your choices too badly, you'll get one more round of scoring before game's end. Cash is simply a tie-breaker at that point, though, so be a good corporate citizen - don't end up taking more than you need. Telly Time - The Telly Time expansion brings new shows, specifically geared towards a UK audience, and the standard set by the base game of close-but-not-close-enough-to-infringe-on-copyright titles still lingers here. These are just as wonderful as the original game's shows, and while it's a shame that they're incompatible with the base game's offerings, the new lineup is refreshing to an audience who have seen the old ones enough. The crown jewel of Telly Time, though, is the rework of genre bonuses. In the base game, when you land your third or fifth show of the same genre, you get viewers and a one-time boost of either ads or stars. Telly Time brings in a bingo card which forces you to diversify your lineup rather than monopolize it. I vastly prefer the Telly Time mechanic to even out the base game; it's far more cutthroat and gives even more player interaction (yet another reason I'm sad I can't use the old shows with the new expansion). Executives - This expansion is the real game-changer. 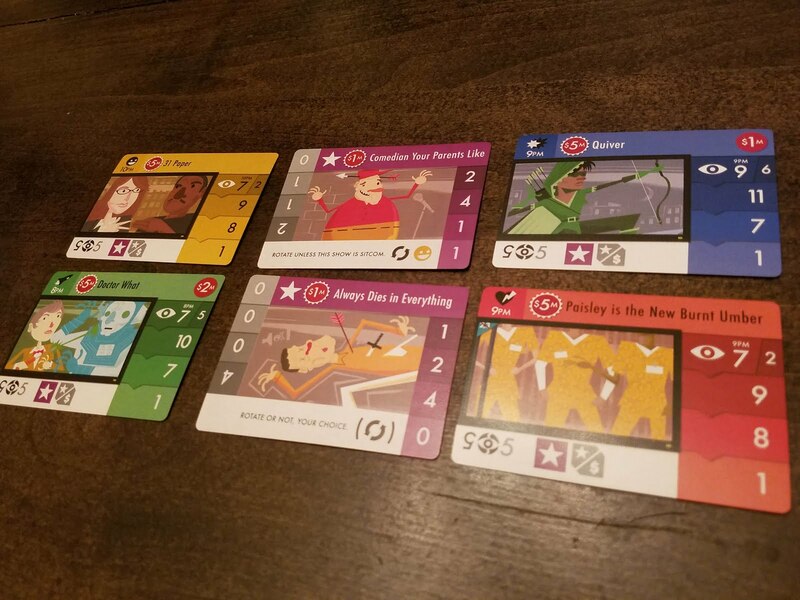 Adding variable player powers to your game is always a dangerous proposition, not only because of balance issues, but also due to the fact that you want to make sure they're all fun. Executives doubles down on this risk by not only adding player powers, but player drawbacks, as well. 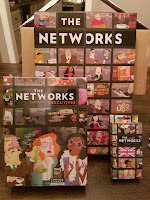 Each executive in the game gets a thematic ability to add to their network and a liability they have to work around. It's the latter that brings a whole new dynamic to the game for me and makes this expansion a must-grab. Additionally (as if you weren't already sold), Executives adds a new game start condition: pilot season. Instead of just assigning your three starting shows to time slots that don't matter, you're instead drafting pilot season shows that very much do. This adds a level of importance to the beginning of the game and starts your strategy engine burning. It's a phenomenal mechanic that may make sure you never play without it. I certainly won't. 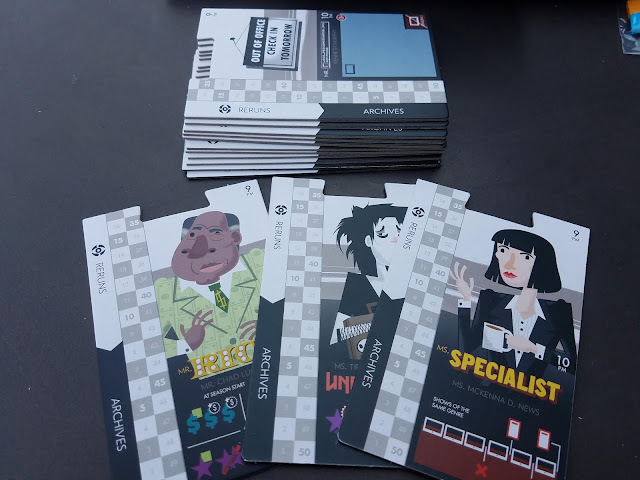 One last note: each executive has both a masculine and feminine side, something I'm noticing that more and more games are doing, and I applaud that. Overall, my feelings about The Networks are mixed. I love drafting, and the choices presented to players here are just right. Ads, Stars, Shows, and Network cards are all different enough from each other and all relevant enough that the strategy involved when it's your turn feels good. On the flip side, five seasons feels too long. I felt like I had reached the limit of what the game had to offer for me right around the time we were finishing season three. 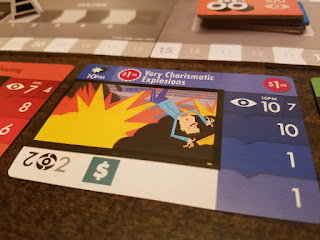 I will provide the caveat, however, that every single person I played this with really enjoyed it, and while they agreed that the game felt "played" around the midpoint, the art and cards in the game gave them a reason to stick around. The expansions solve a lot of this for me. Genre bonuses in the base game drive a big stake through the heart of player interaction, relegating you to playing defense by taking a sci-fi show that doesn't really help your network just to keep the other player from getting their fifth. I have a natural aversion to playing defense in games rather than trying to further my own win conditions, but I understand that's my personal thing. Telly Time brings the delicious bingo genre card, pushing you to diversify your genres and making the occasional sports or quiz show that pops up a table-wide need. Similarly, Executives not only brings variable player powers to the game, but the alternate setup with the pilot season feels SO good. The drawbacks of each of the executives are a master stroke, further increasing the depth of the game. I haven't gotten enough games in yet to tell just how balanced they are with each other, but so far, they feel fine. Artwork and Components: Formal Ferret wisely sticks with Gunther and Kinchy's art for the expansion content, and that's not only welcome from a continuity standpoint, but from a quality one, as well. The art style is delightful and each show that's a knockoff of a famous program has sometimes subtle, sometimes less so, visual clues for watchful fans. 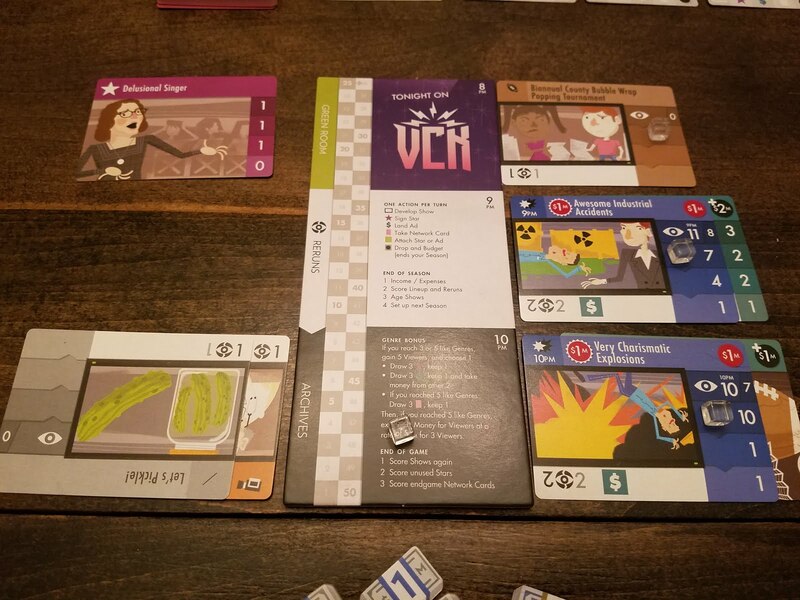 There's very little negative to be said about the artwork, and I'm glad the expansions continue to meet the high bar set by the base game. I was provided with the "Fancy Bits" for the base game (pictured throughout), and oh YES are these worth grabbing. The wooden remotes and TV sets replace the play order discs and score tracker cubes, respectively, and I won't ever go back to the originals. The solid-black show cubes are replaced by clear acrylic, allowing you to see more clearly what's underneath. The base game components do the job, but little else. Even if I didn't have the upgrades, I'd call the base game bits boring and wonder why the art so powerfully evokes the theme, but the components are just serviceable. The Good: Quick drafting gameplay. Game focus is well executed. Art is very good. 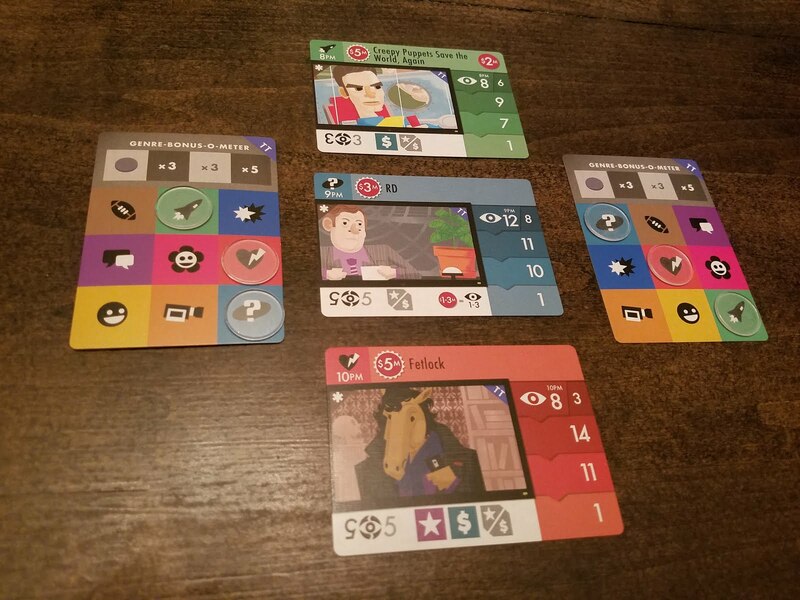 Expansions bring gameplay elements that are very welcome and wonderfully done. The Bad: Game can drag after a bit. Base game components are meh. No box insert can lead to a mess, especially with expansions. 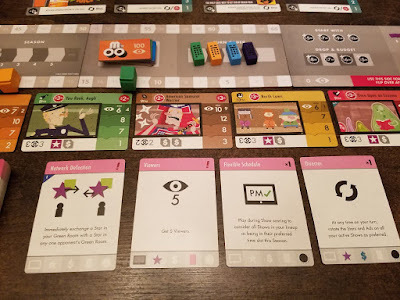 Game is MUCH better with expansions, which is a drag for those who just own the base game and/or can't get them. AP players could lose their minds. 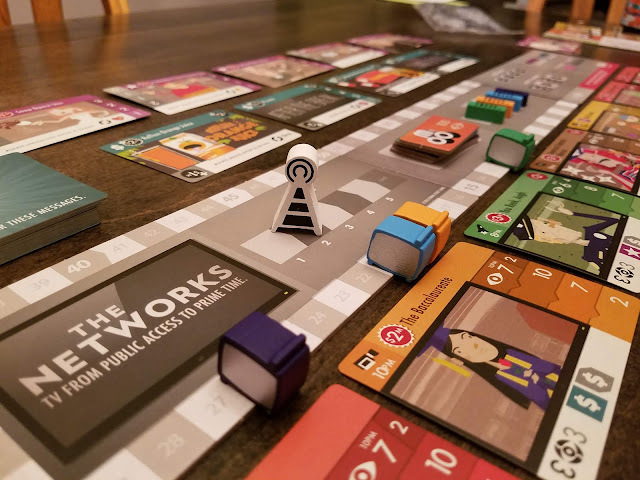 Score: While The Networks for me personally fails to deliver over the five seasons it takes to play a full game, I always enjoyed the games I played with my friends. The expansions are as close as it gets to must-buy, though. They address several of my issues with the base game, and they elevate it to a more interactive experience that's ultimately far more fun. I'm giving The Networks and its expansions Telly Time and Executives a score of Tune In.